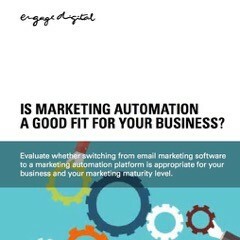 Is Marketing automation a good fit for your business? Learn how switching out your email marketing platform to marketing automation can help you transform your marketing campaigns. Download today! Marketing automation when used effectively will dramatically improve productivity, increase return on marketing investment, aid customer retention and drive customer satisfaction. Knowing whether your business is ready for an upgrade from email marketing platform to marketing automation can be tricky to understand and sell into management.